Sent your computer technician resume but never heard back? Feel like they might need a phone repairman instead? You’re perfect for the job. Yet you’ve heard nothing but crickets. The phone isn’t problem. You’re not the problem. Your resume is the problem. Fixing your computer technician resume is easier than fixing most of the problems you have to deal with on the job. A computer technician resume example better than 9 out of 10 other resumes. How to write a computer technician resume that will land you more interviews. Tips and examples of how to put skills and achievements on a resume for a computer technician. How to describe your experience on a resume for computer technician jobs to get the one you want. Here's a sample resume for a computer technician made using our resume builder. What's the Best Format for a Computer Technician Resume? Nothing will kill your chances of getting hired faster than choosing the wrong format for your computer technician resume. Six seconds. That’s the average time recruiters take to scan a resume. In six seconds, you need to answer the burning question on the recruiter and hiring managers’ minds: Is this candidate qualified for the job? Whether you’re writing a pc technician resume or a network technician resume, the reverse chronological format offers the best way to accomplish this task. Your recent, relevant experience offers the best proof you’ll get things done. It’s the most common format, so recruiters will find the information they need quickly. It shows your career growth. Now choose the right font for your resume. It’s more important than you may realize. Stick with a font that’s easy to read and professional looking like Arial, Helvetica, Calibri, or Verdana. Then, save your computer technician resume as a PDF. It’s the best way to preserve the layout and formatting. Be careful: not all Applicant Tracking Systems (programs that rate resumes) can handle PDFs. Be sure to check the requirements when submitting. In certain cases, a different format may work better. For example, if you have employment gaps or are looking to change careers, your employment history may create more questions than answers. 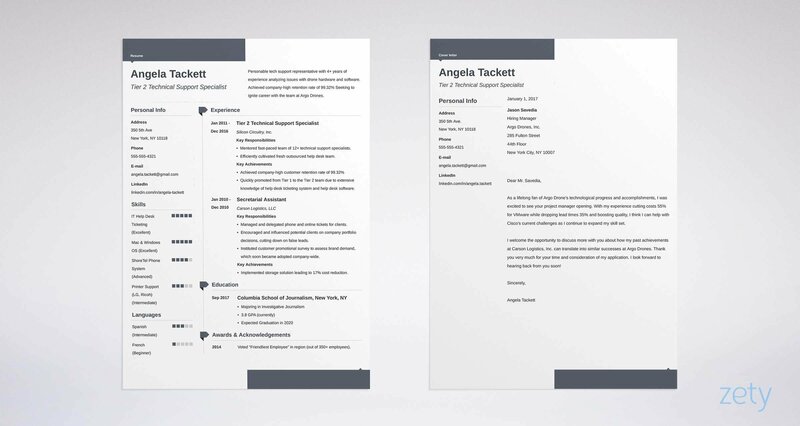 See 3 Resume Formats: How to Choose the Best One [Examples] for guidance. Wondering how long should your resume be? 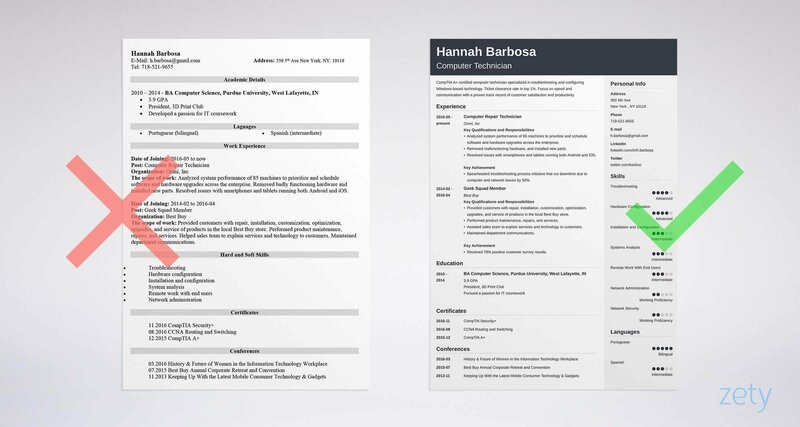 Aim for one page—especially if you’re writing an entry-level computer tech resume. Got gigabytes of relevant experience? Don’t worry if you need two pages to fit it in. Especially if you’re self-employed and writing a freelance computer technician resume. You’ve worked on projects for different people and companies. Let that experience shine! You’re browsing Netflix for something new to watch. A title catches your eye. How do you decide whether you’re going to invest the time to consume this content? If you’re like most people, you read the summary. It’s no different with a resume. A good summary for a computer technician resume can build interest and draw recruiters and hiring managers in. A poor computer tech summary can short-circuit the recruitment process. Writing a good computer technician resume summary isn’t hard to do if you follow these steps. First, read the computer technician job description. Take note of important requirements and skills—the resume keywords. Next, think of the specific skills, experience and accomplishments that best match these requirements. Finally, put it together in a succinct paragraph that communicates your unique value. CompTIA A+ certified computer technician specializing in troubleshooting and configuring Windows-based technology. Ticket clearance rate in top 1%. Focus on speed and communication with a proven track record of customer satisfaction and productivity. Knowledgeable computer technician with experience in troubleshooting, hardware configuration and software installation. Combines excellent technical and people skills. Which resume summary suggests the better computer repair technician? That’s right, the first one. But here’s the twist: both come from the same candidate. In the wrong example of a computer tech resume summary, the candidate simply listed his responsibilities. In the right example? He turned his computer repair technician responsibilities into achievements and put a number on what matters most. Plus, he highlighted the fact he’s a certified computer tech. Are you writing an entry-level computer technician resume with no experience to boast about in a summary? Fear not. You can accomplish the same thing with a resume objective on a computer tech support resume. A resume objective is a short statement at the beginning of a resume that introduces you, expresses your desire for the position and provides reasons the potential employer should consider hiring you. Pro Tip: Don’t let the name fool you. While your objective is to get a job, your resume objective should be about the employer’s needs. Use phrases that speak to the benefits of your qualifications. You can make your computer technician resume objective read like a summary. Read the computer technician job description and match the requirements to your qualifications, including education, certifications and transferable skills. Here’s where it differs. Since you’ll be competing with candidates who have more direct experience, you need to demonstrate a stronger desire to help the employer achieve their goals. Detail-oriented computer technician with strong troubleshooting and communication skills seeking an opportunity to help decrease downtime due to computer issues. Including specifics conveys you’re looking for a good company fit, not just any computer tech job. Seeking a computer technician position with a company in the New York area. What’s in it for the employer? It’s not clear from this computer repair technician resume example. More than any other section of your resume, this is where you prove you’ve got what it takes to do the job. List relevant jobs in reverse-chronological order. Potential employers are most interested in your recent computer technician experience. Don’t waste space listing your computer technician duties and responsibilities. Employers know what you were told to do. They want to know how well you did it. Customize each bullet point to the position you’re targeting. Show that you have experience doing what the company will need you to do if they hire you. Focus on achievements on your resume. Analyzed system performance of 85 machines to prioritize and schedule software and hardware upgrades across the enterprise. Spearheaded troubleshooting process initiative that cut downtime due to computer and network issues by 50%. Responsible for planning and installing system upgrades. Troubleshoot and fix computer and network issues. Notice how much more powerful your descriptions are when they include specific achievements? Want to make your experience sound as good as the example above? Use bullet points to make each achievement easy to read. And quantify whenever possible. Numbers speak louder than words! Pro Tip: Use no more than six bullet points for each position. People won’t remember the points if there are too many. When describing your work experience, add even more power with action words. No more responsible for this, managed that. Remember, your experience is about the action you’ve taken. As with everything else in this section, you should tailor it to the position you’re applying to. Let’s say, for instance, that the ad the employer is looking for someone with problem-solving skills. You’d want to use verbs such as devised, analyzed and enhanced. The education section of a computer technician resume is simple. Just add your degree and school and move on, right? Remember, you’re being judged by everything on your resume. If you want the job, you need to carefully consider every word. The education section is no exception. If you are a recent graduate or current student writing a resume for an entry-level computer technician position this is the perfect place to showcase educational accomplishments. This can offset lack of experience. Pro Tip: Highlight relevant coursework to show you are qualified in areas where you don’t have job experience. If you are more experienced, then you don’t need to include as much, because you want employers to focus on your experience more. Lead with your most impressive information. That means listing your highest degree first. But it also applies to how you structure your listings. If your degree is in a field related to your position, that will be most relevant to employers. But what if your degree is in something else? Then listing the school first might be a better option, especially if it’s prestigious. A computer technician job requires a unique set of technical skills. Employers want to know you have these. But those aren’t the only skills that belong on a computer technician’s resume . Employers also want candidates with a variety of hard and soft skills. Hard skills are teachable and specific to an industry or job title. Examples for computer technician include software and hardware expertise, troubleshooting proficiency, and the ability to install and maintain network peripherals. Soft skills are interpersonal skills such as leadership and the ability to effectively communicate. These are helpful in just about every job and industry. Job postings often list the soft skills they are seeking. Pro Tip: Don’t limit your skills to just this section. Include skills keywords throughout your resume to get through Applicant Tracking Systems. Choose the skills that are most relevant to the position. The job description is a great place to start, especially for the technical skills. Also check out the LinkedIn profiles of computer technicians who have worked for companies similar to the one you’re applying to. This will give you a better idea of the skills these employers value most. But don’t just list skills in a word or two. Add context, specifics and facts or figures to stand out. See this list of skills to put on a computer technician resume? Some work better on a computer hardware technician resume, others on computer network technician resumes. You’ll know which to highlight—especially once you focus on the job description from the ad. If you followed the steps up to this point, you have a pretty compelling computer technician resume. But a cynical recruiter may still have doubts. How can he be sure you are as proficient as you claim? Easy. Include a section that highlights your additional qualifications, such as certification or licenses. These add a level of proof and credibility. Be sure to prioritize these for each application. If you the company uses Cisco products, for example, your CCNP, CCNA or CCiE certification should be at or near the top of the list. Pro Tip: Create a master list of relevant certifications, licenses and awards, Then choose the most relevant for each position each time you personalize your resume. But what if you’re still working on certifications? If you are a current student or recent graduate, you can include a section for awards, honors or even relevant extracurricular activities. The important thing is to demonstrate traits that give employers confidence in your ability and your character. I’m sure you’ve heard this myth before. In fact, it’s so widespread that even major job sites get it wrong. And it’s killing job seekers’ chances of landing their dream job. It can do the same to yours. That cover letters are optional. I get why people would believe it. A busy recruiter barely has time to get through the stack of resumes on her desk, let alone a cover letter. But that’s exactly why they are so important. A recruiter has to pare down that stack before taking a closer look. And an easy way to do that is to eliminate any that don’t include a cover letter. After all, if you skip this step, what steps will you skip on the job? That’s not just my theory. Statistics show up to 45% of recruiters will reject resumes without cover letters. You do, however, want to be concise. Focus on highlighting the most important traits that make you a great fit for the job and conclude by asking for a meeting to discuss things in more detail. You also want to sound warm and personal. Nobody will be impressed by a generic form letter. If possible, use the name of the hiring manager or recruiter. And if you want to stand out, include a bit of information that shows you’ve done your homework. You can usually find something with a quick search of the website and news feeds. Personalize. Above all, employers are looking for a candidate who is a good fit for the company. Mirror the requirements and keywords they used in the job description and your resume and cover letter for that computer tech position will stand out. It’s a little more work than just creating one resume and sending it out whenever you apply to something. But it’s worth the effort. Pack your resume full of action verbs and quantify whenever possible. Do you still have questions about how to make a computer technician resume? Give us a shout in the comments section! 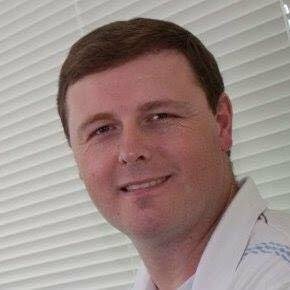 Sean Kirby is an award-winning copywriter and marketing strategist. When he's not writing about himself in the third person, you can find him crafting articles like the one you just read or helping clients increase sales and build their brands. Follow him online.